The most popular domain name appraisal tool in the world is Estibot.com. This tutorial takes you step-by-step through the Estibot.com domain name appraisal tool. You will walk away with an understanding of how the tool works and every aspect of the data it provides. Also covered are five warnings about using Estibot.com that you need to know to avoid making a costly mistake. I would like to thank Luc Lezon of Estibot.com for his guidance and input. 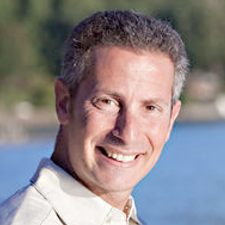 Michael Cyger is an entrepreneur, businessman, investor, speaker and author. He is also the publisher of DomainSherpa.com. The most popular domain name appraisal tool in the world is Estibot.com. Today I’m going to walk you through how to use it so you *really* understand the results. And I’m going to share with you when NOT to use Estibot.com for domain name appraisals. This is NOT a marketing video glossing over features of the software. If you want to get into the weeds and understand how to use this powerful tool to appraise your domain names, stay tuned. Hey everyone, my name is Michael Cyger and I’m the publisher of DomainSherpa.com – the website where you come to learn how to become a successful domain name entrepreneur and investor directly from the experts. Today’s show is a tutorial on how to use the domain name appraisal tool called Estibot.com. I’m going to walk you through exactly how to use it to appraise a domain name, how to interpret the results. We’ll also discuss some tips for when NOT to use Estibot.com for domain name appraisals. Why does Estibot show search volume that’s sometimes significantly higher than the Google AdWords Keyword Tool? Why does Estibot show a certain number of advertisers for a keyword phrase, but I don’t see any advertisers on Google? Now, if you’re only listening to this show – via podcast, MP3, or in iTunes — you’re missing out. The entire show will be me walking through the site and highlighting specific areas of the software. While you’ll still get a lot out of listening to this show, consider coming back and watching the video to see what I’m doing while listening to it. And I also want to start with a disclaimer. Estibot.com and it’s CEO, Luc Lezon, are sponsors of the DomainSherpa show. This tutorial is not a result of that sponsorship. The fact is that just about everyday I use Estibot.com to evaluate and appraise domain names and I was a satisfied, paying customer before they began sponsoring DomainSherpa. And I’m still a paying customer, every month. As is our policy, we do not use affiliate links. Do your due diligence before buying anything, including online services. Now, let’s start at the beginning. What is Estibot.com appraising? It’s not the website, it’s not the business, it’s not a multiple of the earnings or profit of the company. It’s purely a valuation of the domain name. Second level domain dot top level domain. DomainSherpa.com. FreeCashFlow.com. FunnyPictures.com. Second level domain and top level domain. That’s it. Only the domain name. That’s the first big take-away of this tutorial. Let me give you an example. If you plug in a domain name like http://www.sslcertificate.com/, it will not give you a value for that operating business. http://www.estibot.com/appraise.php?a=appraisal&k=c900fa8670a51c012149ab9fba8c940a&domain=sslcertificate.com Do not confuse business valuation with domain name valuation. Estibot can only be used to appraise the domain name. I want to point out one thing before we go over this data, if you try to appraise a second domain name within the same day, you will receive this notice “Daily guest query limit reached. Please login or register to continue using the service.” If you think you’re going to need to appraise more than one domain name per day, consider the Novice account level, which is what I pay for. Back to the results, at the top of the page are four buttons, “appraise another”, “check live availability”, “check whois” and “generate appraisal certificate”. I usually just visit the Estibot.com homepage to appraise another, I go to Go Daddy to check availability, and I don’t – personally – have a need for domain name appraisal certificates, but the check whois is a nice feature. I know from speaking to Luc Lezon that Estibot treats user privacy as a high priority, so if you do a whois search on Estibot, it’s not shared with anyone else. In comparison, if you do a whois search on Go Daddy, they share some of that information with the owner of the domain name. For example, there’s a way to export your domain name list at Go Daddy, and include the number of whois searches in the past 30 days. I found this information on DNForum.com and I’ll put the exact URL in the transcript (http://www.dnforum.com/f209/howto-find-whois-searches-performed-your-domains-godaddy-thread-423438.html). Or just go to DNForum.com and type in the number 423438 in the search box to find the thread that describes how to do that. So, Estibot.com grabs all the whois information daily and stores it in their database, and they don’t share the search information with anyone. Your queries are safe at Estibot. The “Domain Details” are pretty self-explanatory. The domain, the SLD or second level domain is domainsherpa in this case, Estibot does a best guess on splitting the words apart, and they’ve done it correctly here as domain and sherpa, it is English and the category pertains to the Internet. So they got that completely correct. If they happen to split the words incorrectly because, maybe it has an acronym, you can manually update it. You may look at the category and think, “oh, that’s nice – but not important.” But the category can play a role in the domain name valuation. Sometimes domains that fall into a certain category get a small bonus, like if they are related to finance or credit cards, because sometimes those areas are seeing high resale values. So they get a slight bump in the algorithm. And, I believe Estibot.com tweaks these values over time to fit the current market conditions. Looking at this first section, and understanding that Estibot mainly focuses on keywords brings me to the second big take-away. Estibot.com is great at appraising domain names that are keywords, not brandables. What’s a keyword domain name, and what’s a brandable? Keyword domain names are made up of real words that imply user intent. “electroniccigarette.com” includes the words electronic and cigarette, and would likely be searched by someone researching that type of cigarette for purchase. “seoconsultant.com” includes the acronym seo and the word consultant…if you’re a business in need of search engine optimization help, that’s a likely search phrase you’d use on Google or Bing to find one. Brandable names, in contrast, are those you’d never do a search for if you didn’t know of the company. For example, before 2011 nobody searched for domainsherpa. While the words domain and sherpa are two real words in the dictionary, nobody uses the phrase domainsherpa. Similarly, ebay and fiver are two other brandables that had little value before a company invested in making their worth more. iwhatever.com and ewhatever.com are two other examples of brandable domain names. And, a keyword rich domain name can be used as a brandable domain name too. Tide.com, for example, is a brandable word domain name for the laundry soap. Purple.com has the generic word purple in the domain, but is more likely to be used as a brandable domain name. Having said all of that, Estibot.com is not meant to be used to value brandable domain names. While it may come back with a reasonable appraisal value, it’s algorithm – which is based on search volume, advertising, comps and other factors – is not as useful for brandable domain names. Brandable domain name sales primarily depend on who is coming looking to purchase the domain name. If I look at purple.com, for example, it comes back with an estimated value of $353,000, which is probably the right order of magnitude for that brandable domain name. I would not be surprised if it sold for anywhere between $100,000 to $300,000. But if you look at PicTagger.com, a brandable domain name that I own that has an appraisal of $0, I need to figure out who the buyer is and what the domain name is worth to them. I can’t remember who said it in a past interview, but any good brandable domain name is worth at least $1,500. You may have to wait forever to find that buyer, but $1,500 is low enough that someone, over time, will likely find that cost palatable. So, if you make sure you’re using real words that have search intent from real people, then Estibot provides a good domain name appraisal. And here’s the meat of the result: the appraisal. The Estibot value is $110 for DomainSherpa.com. While I paid $500 for the domain name back in 2010, it’s on the same order of magnitude. $100 is pretty much the same as $500. Again, this is a brandable domain name so I’d not use Estibot for an appraisal, but even still it’s correct on an order of magnitude. So this brings me to the second big topic I want to emphasize: Estibot.com is an order of magnitude estimate, not an exact value. $500 and $100 are pretty close. If Estibot would have listed $100,000 as the appraised value and I paid $500, I’d suspect either the seller didn’t know the value of the domain name. And neither did I as I likely wouldn’t have even contacted the seller to buy it. The order of magnitude is correct. Now, let’s say you’re using a keyword-rich domain name that represents the user’s search intent. The next big take-away I want to emphasize is to be careful of appraisals above six figures plus. Six figures plus means any domain name valued at $100,000 or more. It could be $100,000, $500,000 or $2 million dollars. Why? It’s more difficult to appraise a domain name when there are fewer potential buyers. Based on sales history data that the industry has, there are not a lot of sales that occurred above the six figure range. Every day there are sales that occur at the three, four, and five-figure range. But once you start getting into the six figure plus range, data becomes harder to obtain and the valuation becomes trickier. Heck, no two top domain name brokers would likely put the same exact price on a million dollar domain name. It’s very similar to real estate. If you are looking to buy a house that is $50,000 or $100,000, you can look at another house that is two bedroom, one and a half bath on a quarter acre with certain features and think those are pretty good comparison sales. But when you get up in the million plus range for homes, there is going to be something unique in each of those homes that you need to understand. Maybe one is going to be closer to the water or have a better view. Maybe one is going to be west-facing such that you have warm sun every afternoon, or it is going to be wired with every audio/video toy imaginable. And those are going to bump up the price per square foot more than what you would just see by looking at a two bedroom, one and a half bath house on a quarter acre. It’s the same for six figure plus domain names. The valuations become more detailed at the higher levels. Plus, don’t forget, a good domain name broker can sell a great domain name for a lot more. I bring that up only to remind you that valuations aren’t everything. If you have a domain name that appraised at $250,000, it may have few potential buyers but a seasoned salesperson might be able to close the deal at $500,000 with one of the buyers based simply off of their experience and negotiation skills. The “other extensions” section is next, showing you that if all the other major top level domain names are reserved then it’s likely to be a popular keyword phrase. Of course, there are exceptions – in this case, I purchased all the TLDs as brand protection for my registered trademark. And, while I don’t know exactly how the Estibot algorithm works, I’d suspect that they spider the whois records and can determine that only one entity owns all the domain names, which would likely have one impact on the valuation versus six different registrant entities owning the six top level domains. The “related domain names for sale” section is just promotional and leads to BuyDomains.com. As the help indicator displays, Estibot is not sharing your domain name search information with any outside parties. The next section is “related sales”. These are like the comps or comparison homes you would run on a neighborhood where you were interested in buying a house. The “search overview” is the next section, and this is one I had difficulty understanding at first. There are two fields, average search results and ad count, and two options, keyword and SLD. So the average search results is roughly how many results show up in Google if you look up this keyword phrase. In other words, the number of pages in Google’s index for that keyword phrase. And then underneath it is how many advertisers are showing up for the keyword phrase split apart, and as one word. And “keyword” is for a search of domain sherpa as two words. The “sld” is for the second level domain without the top level domain, so it is evaluating domainsherpa as one word. If you have a single word domain name, like purple.com, it would obviously be the same for both. The next section is the “traffic rank”. According to Alexa.com, DomainSherpa.com is one of the top 80,000 websites in the world by traffic. And according to Google’s algorithm called PageRank, DomainSherpa.com has a PR of 4. I’m not going to go into the validity of either of these pieces of information; I just consider them to be pieces of data. Clearly if you’re evaluating picking up a domain name that’s expiring on the drop, knowing if it has traffic and PageRank is of use to you if you plan to monetize it or build it. It could help you short circuit the process. For those that aren’t familiar with search engine history, GoTo.com was a search engine that launched in 1998, went public in 1999, and changed it name to Overture in 2001. In 2003, Overture bought two other search engines named AllTheWeb.com and Alta Vista before being acquired by Yahoo. So while Overture doesn’t exist any more, a lot of domain name investors still love that data and Estibot has it saved from 10 plus years ago. Why do some domain name investors love the Overture data? They love it because it’s sometimes an accurate proxy estimate for type-ins for the domain name on a per day basis. In other words, it’s an estimate of the number of times real people would type in the keyword phrase plus the top level domain and hit enter which would take them directly to the website – on a per day basis. So, the higher that number, the better. Obviously it is not going to work for any new domain. So it is not going to work for DomainSherpa because there is no data for it back from 2003. Or any generic keyword phrase that wasn’t in existence before 2004, like electronic cigarette. And WordTracker was sort of a competitor to Overture, so that data is in there too for reference. It’s also an archive, not real data, and I don’t see much value from it personally. The final two sections are “Average Monthly Search Stats” and include both broad and exact. What’s the difference? Well, it’s listed right here on the screen. If we look at electronic cigarette as our example, the search in [brackets], known as exact search, indicates the number of searches per month for the exact term ‘electronic cigarette’. The broad match indicates the number of monthly searches for any term containing ‘electronic cigarette’, for example ‘cheap electronic cigarette’ or ‘get electronic cigarette now’. Estibot.com recommends using the exact search number as an indicator of search volume, and I agree with that. 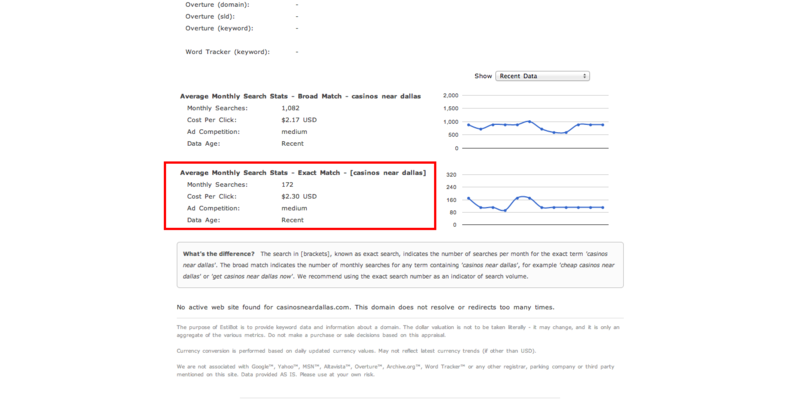 Now, why does Estibot.com’s broad match show 1,860,000 per month when Google’s broad match shows 550,000? And why does Estibot.com’s exact match show 249,240 per month when Google’s exact match shows 90,500. 1. Google only has 67% of the search engine market share, as a recent Search Engine Watch report described. So it doesn’t include Bing and Yahoo, which bring the total up to about 98% of the market share. 2. My Google AdWords Keyword Tool is set to USA traffic. If I go back and reset it to include all countries, the broad match search shows 1,500,000 and the exact match search shows 201,000. Both closer to what Estibot displays. If I look at the appraisal for SSLCertificate.com, I can see about 41,000 exact match searches per month on all search engines, and a massive advertiser cost per click of $25.87. The average ad competition is high, which means that it’s likely going to be really difficult to rank this domain for “SSL Certificate” in Google as well. So while the Rosener Equation would value this domain name at more than $1 million, Estibot.com for some reason values it at $55,000. And that’s my fifth and final take-away. There are always going to be exceptions to the rule. Don’t be a dumbster and assume that technology is always right and rely on it without using your brain. You’re likely using the tool to make financial decisions, and a computer program should not be relied on solely for that decision. Go to a conference like TRAFFIC or join a discussion board like DNForum.com, make friends in the industry, ping others on Skype and ask them what they’d value a domain name at that you’re thinking of buying. You need to gather data from multiple data sources; Estibot.com is one great data source. Get another. Lastly on the appraisal page, if there’s an active website on the domain name it will show some web site stats. On DomainSherpa.com, you can see the title, meta keywords, ip address, and various other details. If you have additional questions, please post them in the comments below and I’ll do my best in answering them. If you have questions about other features on Estibot.com – like the lead generator and email tool for domain name sales – let me know in the comments too. I’m always looking for ideas for future shows. Thanks for watching DomainSherpa. We’ll see you next time. I have to correct my last reply, i meant to say casinos near dallas, not casinos in dallas. Google Adwords Keyword Planner shows “casinos near dallas” has 260 average monthly searches (https://www.domainsherpa.com/wp-content/uploads/2014/02/gakpcasinosneardallas.png). Estibot shows 172 (https://www.domainsherpa.com/wp-content/uploads/2014/02/estibotcasinosneardallas.png). Those two numbers are close enough for me. Neither of these should be taken as absolute…you may find hitting different Google servers may produce different results as they update their data. Just consider the data an order of magnitude estimate. Take both sources, make sure they’re in line and use the data you have to make a decision. If there was a discrepancy, I would guess that Google might update their data more frequently than Estibot, but I do not know for sure. In this case, the difference between 260 and 172 is negligible. If you noticed one data source saying 5,000 and another saying 500, that would be a case to spend some time to investigate further. Great job as usual in the quality that you continue to provide in information through the videos, as well as the subscription. I am interested in selling, maybe leasing, some of the .com names I have, and understand that Estibot has a paid for service that can provide email addresses for domain names that have a match, or close match, with a domainer’s particular domain name. These email addresses that are provided (I believe they provide exact email addresses) can be cut and pasted and placed into an email (the domainer would do this) accompanied with a soft sales pitch to the recipients regarding the benefit of owning such a domain name that the domainer wishes to sell to them. I would like to know if it is as easy as that, where if Estibot provides, say, 10, 50, or 500 email addresses, for any domain name that is typed into this service they provide, that these email addresses can easily be copied and pasted into an email, as I had just described above, and sent out with the sales pitch. If so, then showing exactly how this is done, the research on Estibot to obtain the email addresses, and the putting together of a sample ideal email sales pitch, I think will make for a very interesting video. Any decent .com domain name, that is memorable, has respectable organic type-in traffic, does have a good, to very good chance of selling — when there’s a “match of interest” end user at bay. Could you provide a video on exactly how to use this particular service of Estibot? Also, other ways of finding potential end users such as: looking up a domain name that someone may want to sell — using the Google search bar. Looking up that particular domain name, with the words separate with a space in between (if it’s a two worder, or three worder .com), and with quotation marks placed on either side of the name to get a true number of relevant matches. So, the results that come up in the Google search, would show potential end users who may, or may not, be competitors, and strong advertisers for the domain name being queried. For example: AirBeds.com, would be placed into the Google search bar as: “Air Beds”, thus when the search is done it will be providing a lesser quantity of results, but instead, delivering results that are of high quality concentrated relevance, compared to a search without quotations marks, and receiving a lot of diluted fluff results. This narrowed quotation search, on Google, would be somewhat, analogous to an “exact” search (local and global searches for a keyword term), through the Google Adword Keyword Tool. Also, any other highly effective pointers you can provide, especially if it takes the domainer initiative, and time, to find end users — which can lead to strong potential buyers. Time and effort spent on anything, usually leads to better and faster results, as opposed to just waiting, and waiting only, for a name to sell on a particular website. And, of course, any other ideas you have on finding the best ways to sell domain names. In general, maybe through sites like Flippa (although the video you recently had — the owner seemed to sway to website selling, and not so much individual domain names. That I feel is a loss of healthy revenue for him), or other sites like Name Jet, Protrada, etc. Well that’s it Michael. Just wanted to provide you some feedback which you ask for at the end of all your video interviews. Again, a big fan of Domain Sherpa, and you absolutely are an excellent source of information and the leader in the domain name industry. Great input. Thank you for taking the time to provide such detailed examples of the type of information you’re looking for. To be honest, I’m not an expert on the Estibot lead generator tool, although I have had a short tutorial by Luc Lezon of Estibot.com. I’d be happy to to a video tutorial walking you through how to use it, and the variations you may want to pursue (e.g., using the Estibot tool to email, downloading email/names and emailing directly, etc.). They’re both enlightening, but I will definitely look for more options to include. I’m not a domain seller, so it will be interesting to look at this issue with fresh eyes. Thanks again for your detailed input. It’s much appreciated! Thank you for the links Michael. Thanks, Bipin. I’m happy to hear you found it useful. Glad to hear you learned a few things. I know I did by going this deep to share it. I particularly found the Overture data particularly insightful. And with one domain I own that I own that is a category-defining, generic two-word .COM that actually gets type-ins, I found it to be accurate on an order of magnitude basis. Up until about a year ago, I never parked my domains. Then everyone was saying how great InternetTraffic.com was for parking, so I decided to sign up and see what I was missing all these years. Unfortunately, I found out that most of my domain names are not worth parking. :( Having said that, I don’t think it’s any reflection on InternetTraffic.com — it’s more of a factor of my domains. I tend to build-out my best domain names and the ones, redirect ancillary to my main domains, and only park the domains I have plans for or want to disposition. I’m sure many platforms do that, but this is the only one I’ve used, and it works well. I can also customize my HelloBar notification to say “PICTagger.com is listed in the marketplace at DomainNameSales.com. Click here to inquire about purchase or lease.” I am always interested in generating cash, rather than a sale. Very useful tutorial. Thank you, Michael. Great, in-depth interview. Nothing like it in the industry, and I’m appreciative! Thanks, Tom. Glad it was helpful for you.